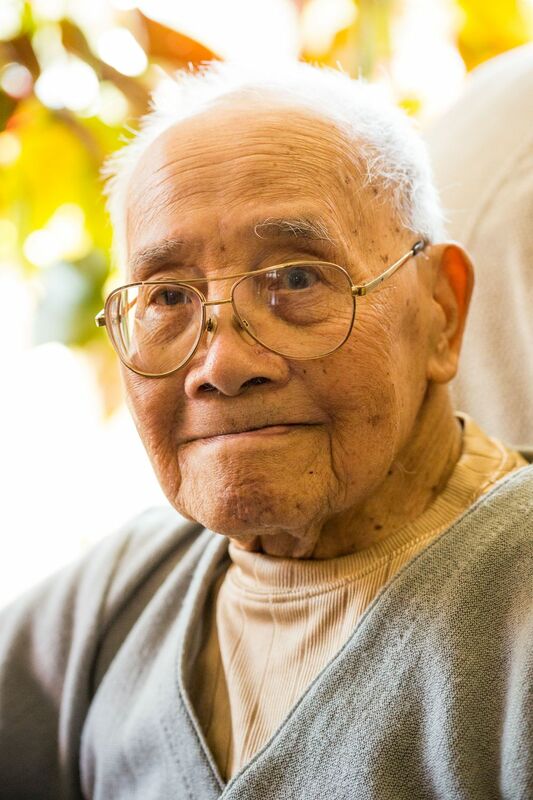 This Filipino-American WWII veteran lived to 104 in Anchorage. He’s finally been recognized for his service. Alfredo Agron's life was a long one. When he died two years ago at the age of 104, he had been Alaska's oldest World War II veteran. All of those years were not quite long enough for Agron to be recognized with the nation's highest civilian honor for his service to the United States during a war that ended in 1945. That happened the last week of October, when Agron's three sons, 90-year-old wife, Pacita, and some of his grandchildren traveled to Washington, D.C., to accept a long-delayed honor on his behalf: the Congressional Gold Medal, which was awarded collectively to Filipino and Filipino-American soldiers who served during World War II. Honorees were given bronze replicas of the medal in a ceremony in Emancipation Hall at the U.S. Capitol on Oct. 25 attended by hundreds. Pacita Agron accepted the award on behalf of her late husband. 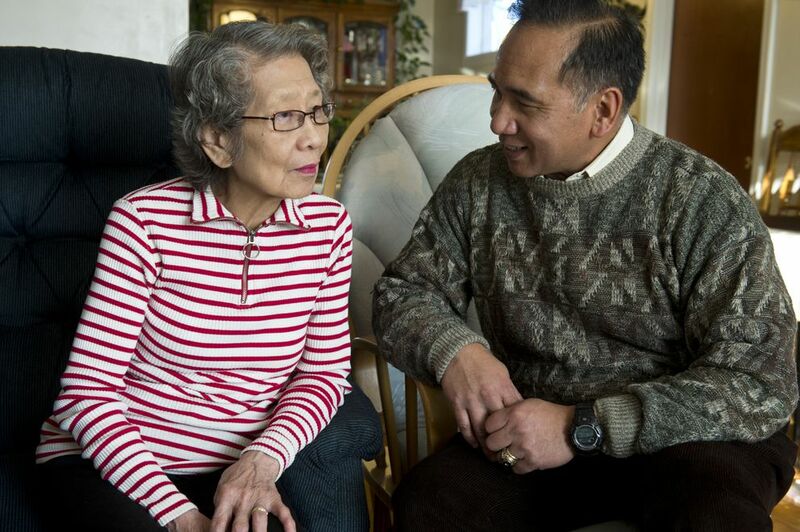 "He's my hero," his son Gary Agron said in the Airport Heights home his father built and where Pacita still lives surrounded by houseplants and family photos. Alfredo Agron first traveled to the United States in 1931 and had worked as a farm laborer in California and the Pacific Northwest for a decade when he answered the call to help his adopted country in 1942. He was sent to his hometown of Claveria, in the northern Philippines, as part of the U.S. Army's First Philippine Regiment. He lived among friends and family in his hometown while quietly seeking out intelligence about enemy movements — and risking his life if the Japanese occupiers found out what he was doing. "Of course they would have killed him, or captured him," Pacita said. 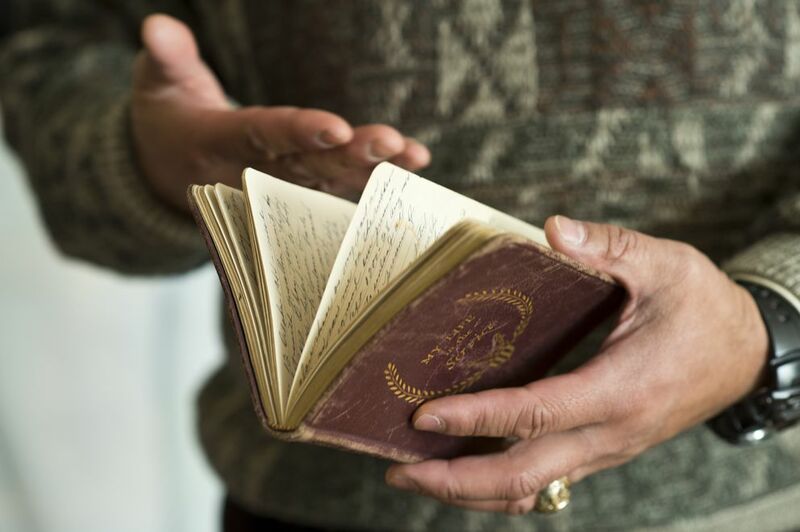 He kept a detailed journal in a small, red book. The last entry before the war ended: "I can only hope that I and many others here have not fought in vain. Many lives have been sacrificed for the sake of humanity. And with the divine guidance of our Lord, we should all be free from fear and want." 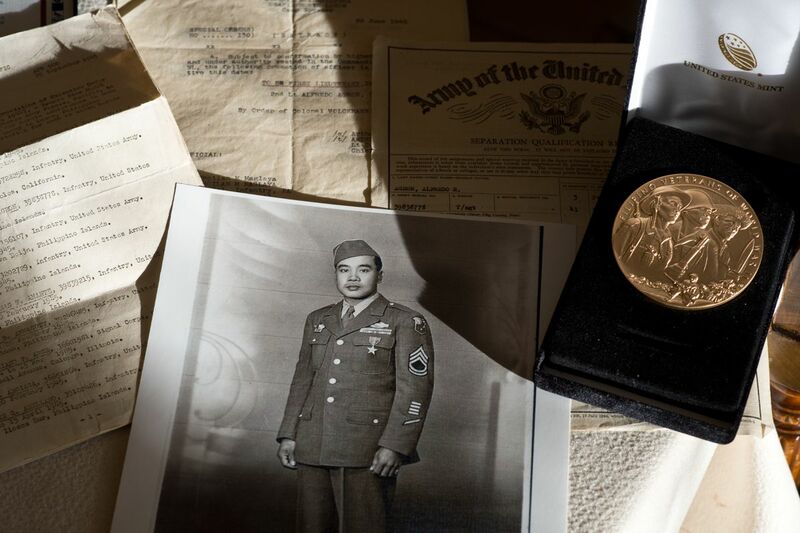 Agron was one of more than 260,000 Filipino soldiers who fought for the U.S. during the war. More than 57,000 were killed. The government promised citizenship and benefits for Filipinos when they enlisted to fight for the United States. "They said, 'We will treat you as American soldiers,' " Gary said. Those promises were rescinded by laws signed by President Harry Truman after the war was over. At the time, Agron was stripped of his rank and discharged from the Army. Ever since, Filipino veterans have been fighting to get their service and status as U.S. veterans acknowledged, said Gary. In 2016 Congress passed legislation to honor the Filipino and Filipino-American veterans with the Congressional Gold Medal. Fewer than 18,000 of them are still alive today, according to the bill's sponsors, Hawaii Sen. Tulsi Gabbard and Congresswoman Mazie Hirono. Most of the people at the ceremony were next-of-kin of veterans who've died, Gary said. Some of the living veterans had waited 75 years for promised benefits. His father was lucky because he had already been naturalized with U.S. citizenship before he was sent to the Philippines, Gary said. Gary Agron, a West Point graduate who retired as a U.S. Army colonel, helped his father get the military benefits he was entitled to. When Alfredo Agron died at home in 2015, the U.S. Department of Veterans Affairs provided help with hospice. "I was able to help tear down a lot of walls for him," Gary said. The Agron family want to get the story out to Alaska's other Filipino-American communities, which include significant populations in Kodiak and Juneau, Gary said. Maybe there's someone else who served in World War II and would also be eligible for the Congressional Gold Medal. He says he can help explain the paperwork necessary to claim the honor. After the war, Alfredo returned to the United States and in 1951 took a job in far-off Alaska, helping to build some of the original structures at what is now Joint Base Elmendorf-Richardson. He went on to meet Pacita, a schoolteacher and beauty queen, on a trip to the Philippines. She joined him in Alaska and together they raised three sons. His father was a quiet, humble man who didn't like the limelight, Gary said. But he would have liked to see his fellow Filipino veterans finally get the acknowledgement and honor of the Congressional Gold Medal, he said. "The U.S. has finally said, 'Yes, we recognize your sacrifices,' " he said.